Lights on the Lake is just two days away! Do you plan to attend? Here is everything you could need to know! Where? Pecan Grove Park West- take 1417 to Canyon Creek, approximately 1 mile south of Highway 82, you’ll see the signs! Parking? There are two lots right outside the park, one of these reserved for handicap vehicles, but they fill up pretty quick. Faith Church and Fusion Bible have remote parking, with TAPS taking you to and from the park. Leaving the park? We know it feels like a long time, but in the past we have had everyone out of the park by 11:30pm, so don’t feel like you are going to be stuck all night! That’s an hour and a half at most. Grab a snack and make friends with those waiting with you! We work as fast as we can! Music? Yes! We LOVE live music. Spur 503 will be playing until about 7:15, which is when we will have a welcome from Mayor Cary Wacker and the National Anthem. Tommy and the Dee Wops will start at 7:45 and play until the fireworks show! They will play a few more songs after the fireworks show, so if you want to stay and listen while the first couple of shuttles go to remote parking, you will have something to do! Fireworks? Fireworks will start at 9:30 and the music will be aired on Hot 107.3 fm. Are you having a party in one oft he surrounding neighborhoods? 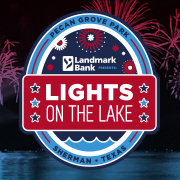 Tune in and let us know that you participated in Lights on the Lake remotely! Coolers? Sure! We will have food vendors, but please feel free to bring your coolers and have a picnic! Dogs? Yes, just like all parks in Sherman, as long as your dog is on a leash and you clean up after them, you are welcome to bring them! Thursday? Yes, it is on Thursday! We want everyone to have an opportunity to visit multiple shows in our area. Did we miss anything? Let us know! We want everyone to have a great time and be prepared for the evening!